Reference Optical Quartz is the first of its kind, consisting of 210 separate boro-silicate glass fibres. The cable allows you to experience stunning sound when connecting DACs, TV's, CD players and Blu-Ray players to amplifiers or receivers because it has a much higher bandwidth and only 1/10th of the attenuation of traditional acrylic fibres. Reference Optical Quartz vastly exceeds the demands for high definition multi-channel digital audio with a bandwidth of over 150MHz which is totally unaffected by bending the cable. QED's new Glasscore™ technology employs multiple fibre bundles of ultra-fine boro-silicate glass optical fibres (GOF) of no more than 50um each to make up the 1 mm diameter necessary to conform to the Toslink standard connectors. Because the fibres are so small the different paths taken by the light rays are similar in length virtually eliminating the timing error and introducing less distortion and jitter. This has the effect of increasing bandwidth and the accuracy of the data transmission. The quartz fibres are coated with a cladding of low Refractive Index to guide the light signal. This vastly exceeds the demands for high definition multi-channel HD digital audio. In contrast to conventional acrylic glass optical cables quartz glass cables can deliver signals up to and including 24bit/192kHz with very low jitter . Reference Optical Quartz can provide a much higher bandwidth than a single acrylic glass fibre with 1/10th of the attenuation. QED have calculated that jitter (distortions caused by timing differences between the different light paths) in conventional optical cables could typically reach up to 145ps. In Reference Optical Quartz, timing errors are virtually eliminated, introducing less distortion, jitter and ultra low loss < 0.03 dB/m. 24 & 32 bit high resolution audio compatible. 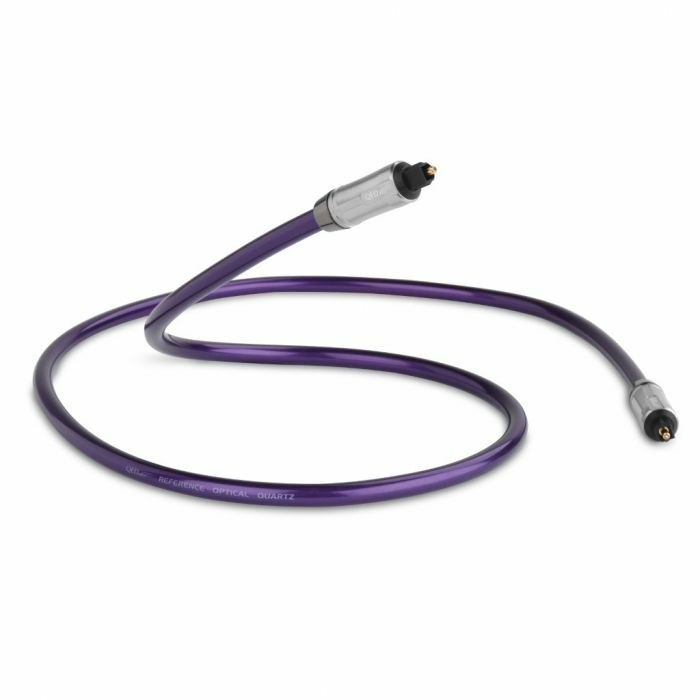 Digital Optical Audio cables are now used widely to connect audio source equipment such as TV's, CD players and Blu-Ray players to amplifiers or receivers. There are many advantages to using the optical output from your source equipment. The optical output provides complete electrical isolation between equipment eliminating ground loops and noise induced by large external voltages or currents. With fast digital signalling using twisted pair copper cables, problems such as near end crosstalk can cause distortion of the signal; these problems are eliminated by using the digital optical connection option. of up to 145ps into the SPDIF signal. These plastic optical fibres (POF) account for virtually all commercially available Digital Optical Audio cables available today. The alternative to this situation adopted by QED in our new Glasscore™ technology cable is to employ multiple fibre bundles of ultra-fine boro-silicate glass optical fibres (GOF) of no more than 50um each (thinner than a human hair see below) to make up the 1 mm diameter necessary to conform to the Toslink standard connectors. In the new QED Reference Optical Quartz cable there are 210 such fibres each of which guide the light along a much tighter path making the different modes much more uniform than in the larger diameter single fibres. Because the range of angles of incidence at which the light is accepted at the aperture of the cable is smaller and the critical angle of internal reflection in the glass is larger than in POF fibres the range of different paths taken by the light is reduced. In this way short data pulses are no longer artificially elongated or smeared by the physical process of travelling along the cable. up the 1 mm diameter necessary to conform to the Toslink standard connectors. A typical optical fibre is made of an acrylic glass material known as PMMA (Polymethyl-methacrylate). This acrylic core allows the light to take many different length paths through it. Timing differences are introduced - accounting for typically up to 145ps of Jitter. Signal losses also occur when light is incident above the Critical Angle and is not reflected back (Yellow). Reference Optical Quartz has in excess of 210 Glasscore™ fibres each thinner than a human hair. This ensures ultra low jitter because the smaller numerical aperture reduces the range of angles of acceptance leading to straighter signal paths. Instead of using traditional low performance polymethyl methacrylate (PMMA) plastic optical fibres (POF) which come as a single 1 mm OD fibre the cable incorporates 210+ boro-silcate glass optical fibres (GOF) which give improved jitter performance and higher bandwidth capability. 24 & 32 bit high resolution audio compatible.